Optimizing smart contract storage usage for structured data. I worked with BigData clusters and during that time we used to value storage much. Should't we value it even more in case of blockchain? Blockchain is bloating, fee per storage per year is ahead. 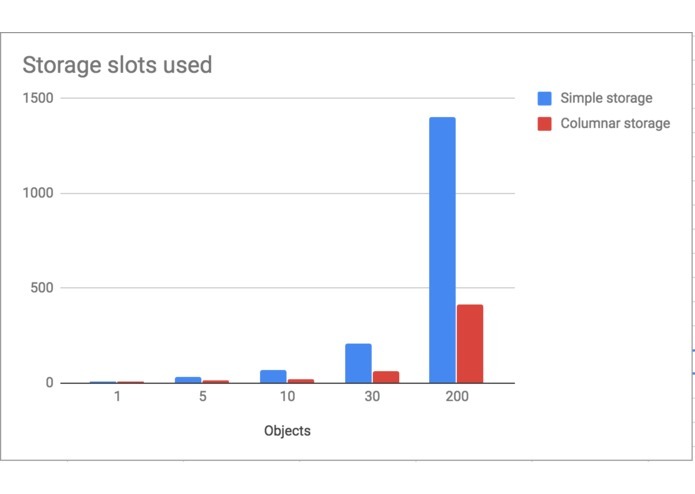 There is a beautiful idea of columnar storage (Google BigTable, HBase, Cassandra, ...) and this project is inspired by it, particularly by Apache Parquet and Protocol Buffers. Optimizing smart contract storage slots usage for structured data. It'll save every full node disk space and your fees. I've implemented well known ideas and techniques in solidity. It was't feasible to implement more sophisticated techniques (like dictionary coding, delta encoding) during hackathon because it'd require to cache and preprocess many objects, which is in turn difficult due to lack of adequate memory allocator. Space economy is 3x. I managed to create and test full cycle of work with columnar data, to create code generator, to measure performance gains. There is a wide area for optimization of current approaches to Ethereum smart contract development. I expect to see advanced memory allocator, rich solidity standard library, performant storage solutions in the near future. Further work is outlined in repo: search by hash, optional fields, unlimited fields and so on.